With few exceptions, concrete slabs need to be reinforced with either rebar or re-mesh. Concrete has exceptional compressive strength. However, in relation to its compressive strength, concrete has weak tensile strength. That is to say, it is very difficult to crush concrete. It is much easier, on the other hand, to pull it apart. How Concrete is Strong – The sand and crushed rock in concrete give it compressive strength. The sand and rock in concrete can support tremendous amounts of weight. The harder the rock and the more rock in the mix ratio, the greater the compressive strength of the concrete. While the standard mix ratio is four-two-one — four parts crushed rock; two parts sand; and one part cement — that ratio can be adjusted to give the concrete greater compressive strength. Tensile Resistance Fails First in Slabs – The reason reinforced concrete slabs are necessary is because it is not the compressive integrity of a slab that fails first. It is the tensile resistance that gives way. The reason slabs crack and break is because of the tensile resistance of concrete. While the rocks and sand in concrete give it compressive strength, all the tensile strength of concrete comes from the cement and cement is considerably less tensile strength than rocks and sand have compressive strength. The tensile strength of concrete is ten times less than the compressive strength. Tensile strength is a material’s adherence strength. 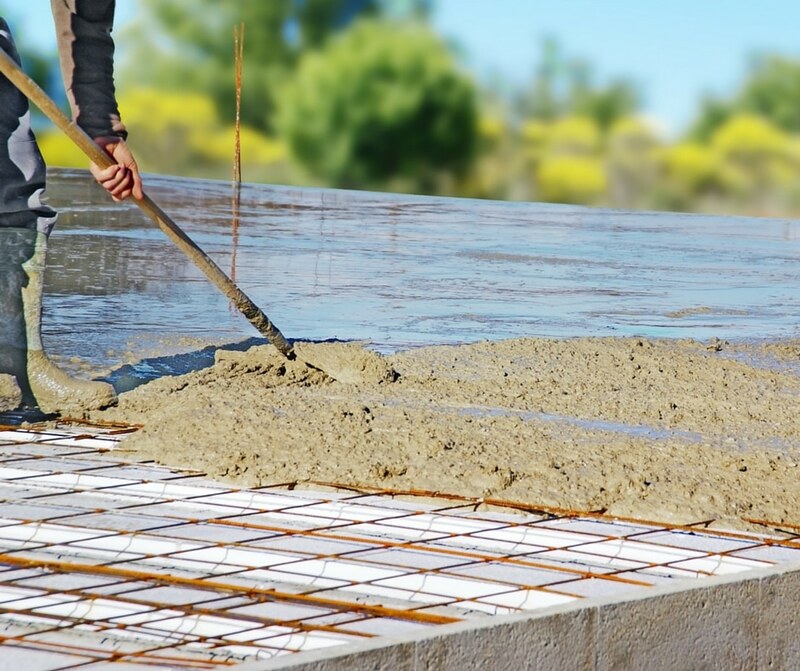 Cement is the adhesive that keeps the three components of concrete — once it cures — intact. But, like glue, cement can be pulled apart. Bending and torsion test the tensile strength of concrete. Like a stick being snapped, as the ground under a concrete slab settles or swells, the cement cracks at the point of impact. Reinforcing Bar and Reinforcing Mesh- The solution for dealing with concrete’s weak tensile strength is reinforcing bar (rebar) and reinforcing mesh (remesh). Intuitively, it would not seems like rebar and remesh could strengthen the tensile strength of concrete. Rebar bends and flexes when picked up. Remesh is even more flaccid. However, when incased in concrete, these two add substantial tensile strength to concrete because pressure from tensile weight is distributed throughout the length of the bars. Additionally, when the bars are tied in a grid, with perpendicular overlaps, the tensile strength of the rebar is increased considerably. Rebar Size and Reinforcing Cages- Generally a single curtain of rebar laid flat gives a concrete slab more than enough tensile strength to survive shifts and swell in the earth beneath it. However for situations where extra strength is required, there are two options. The first is to increase the size of the rebar used. For every 1/4 inch the diameter of rebar increases, the sheer load resistance more than doubles. For example, the sheer load bearing of #4 rebar — 5/8-inch rebar — is 13,564 pounds per square inch. Rebar with a diameter of 7/8 of an inch — #6 rebar — has a sheer load bearing of 30,148 pounds per square inch. The sheer load bearing of #11 rebar, which is one and five-eights inch rebar is seven times stronger than #4 rebar. Another means of increasing the tensile strength of a slab is to double the curtain with a cage. A reinforced concrete slab with an interior cage is more than four times stronger than a slab with a single horizontal curtain. While more than twice the cost, because of the sum of the rebar, reinforced concrete slabs with cages are strong enough to hang and still support weight above. An example of reinforced concrete slabs with interior cages are the patios hanging out from the sides of apartment buildings. When working with concrete, it’s important to know its strengths and weaknesses. It could be the difference between a job well done or a job that literally cracks. Make sure your knowledge of concrete is backed with the right tools to make your projects a success from start to finish to years to come.